Don performed directing and/or management roles at Universal Studios Hollywood and Busch Gardens, XXIII and XXV Superbowl Half-Time Shows, Liberty Weekend, 1984 Louisiana World Exposition; Los Angeles’ Ensemble Studio Theater/LA and George Schaefer’s Musical Theater/LA at the Doolittle Theater, and independent productions at the Roxy and Canon Theaters. 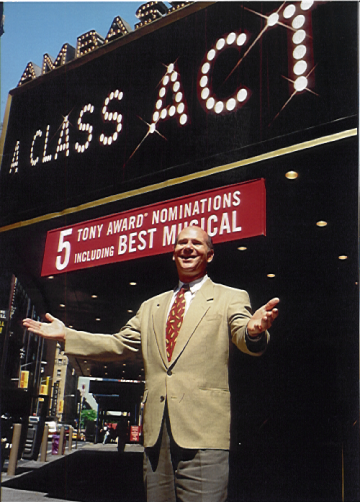 After starting Town Square Productions, Inc. in 2001, he continued his managing credits for Broadway, Off-Broadway, Touring and Regional productions (see Milestones). For theme parks, Don developed and produced KATONGA for Busch Gardens, Tampa, Winner of IAAPA’s BIG E award for the Best Show in 2004. Don is also Producer/Creative Director for BELIEVE a significant re-imagining of Seaworld’s killer whale show in the Florida, Texas and California parks for the Anheuser-Busch Companies. BELIEVE is Winner of the BIG E Best Show award from IAAPA, as well as the THEA Award for Best Live Show from the Theme Entertainment Association for 2006. In 2002, Don spoke at the International Cultural Industry Forum in Nanjing, China, beginning a dialogue on international exchange in theater and dance. He served as COO of Broadway China Ventures, developing Nederlander Worldwide Entertainment’s interests in theatrical presentation and theater management in Mainland China. Under the first joint venture endorsed by the PRC’s Ministry of Culture, Don supervised the inaugural year in China, which included the tour 42ND STREET in 9 cities to 100,000 spectators. The 2008-09 season realized an 11-week tour of Elton John’s AIDA in China, and the co-production with the Central Academy of Drama’s FAME in mandarin in Beijing, which then toured China in 2009-2010.